The world’s first studio electronic effects box – the legendary phaser - now emulated perfectly as a plug-in for your DAW! ​LITTLE FERRY, NJ, USA, Winter NAMM 2019 - January 23, 2019: Recording effects and technology pioneers from Eventide are proud to announce the release of the Instant Phaser Mk II plug-in for engineers, producers and musicians using Mac/PC. Crafted from the original analog hardware that Eventide created in 1972, the “Instant Phaser” sound has been captured and fashioned for modern-day versatility. The Instant Phaser Mk II delivers the original sonic character and retains the same look and feel of the the first rackmount electronic effects box to ever hit the studio. Harness the effect that was used on countless iconic recordings – such as Led Zeppelin’s “Kashmir”, and furnish your mixes with this “Instant” classic. For a limited time, the Instant Phaser Mk II plug-in is available for only $37*. Michael Thorpe — former CEO of MODE MACHINES — has joined Behringer to lead its German synthesizer, lighting, and accessory divisions in his newly-appointed role as Customer Solutions Leader (CSL). Michael has been in the audio industry since 1996 and successfully ran his own company, MODE MACHINES, which designed and manufactured products for the music industry. During more than 20 years Michael gained tremendous experience in product design, manufacturing, and also marketing, which he will now bring to Behringer. ​Following in the hard-to-follow footsteps of the critically-acclaimed and continually commercial LONDON CONTEMPORARY ORCHESTRA STRINGS, Spitfire Audio’s next collaborative venture with the LCO — one of the UK’s most innovative and respected ensembles, promoting the best new music and cross-arts collaborations to an ever-widening audience — had to be something even more extraordinary. End-game? An ambition to collectively create something that no one in the sampling world had done before. But surely that’s easier said than done? Perhaps. Jan 24, 2019, Little Ferry NJ – Winter NAMM Show: Eventide Audio is pleased to announce a significant software update for their flagship multi- effects processors, the H9000 and H9000R. This software update will provide popular vintage effects and a new surround tool that will appeal to musicians and composers for music creation, composition scoring, mixing for television, sound design and much more. The emote V 1.1 software update will include support for the most popular DAWs, and subsequently, the H9000R will be also be available for shipping by the end of Q1 2019! NI announces new entry-level hardware, a free tier of KOMPLETE, TRAKTOR DJ 2, Sounds.com integration for MASCHINE and KOMPLETE KONTROL, and more . . .
Berlin, January 24, 2019 – Following its biggest ever release in September 2018, Native Instruments today announces four new easy-to-use, affordable, and powerful products. Included are two new KOMPLETE audio interfaces, the most portable KOMPLETE KONTROL keyboard to date, a new free tier of the KOMPLETE production suite, and a new generation of the TRAKTOR DJ app. These new products are accompanied by a refresh of Sounds.com, the expansion of Native Kontrol Standard (NKS) to include loops and samples, and tighter integration of Sounds.com with updated MASCHINE and KOMPLETE KONTROL software – further integrating NI’s connected ecosystem of creative tools into one seamless workflow. ​The latest (version 2.0) free firmware for the flagship Quantum Synthesizer incorporates new venture Vision 4 Instruments’ future- facing Kernel synthesis engine. Extending capabilities above and beyond the four — Wavetable, Waveform, Resonator, and Particle (classic and granular sampling) — synthesis engines already available at the Quantum Synthesizer’s super-creative core, Kernel provides a fifth option for each of the three oscillators in its oscillator section. Anaheim, California 2019/01/22: Blue Cat Audio is announcing significant updates for its dynamics processing and audio analysis plug-ins. ​The user interface of the Blue Cat's Dynamics and Protector plug-ins have been fully redesigned (see attached screenshots), and the appearance of the analysis plug-ins has also been refreshed. All plug-ins are now fully zoomable to adapt to the size of the screen. Anaheim, California 2019/01/22: Blue Cat Audio is announcing Blue Cat's Re-Guitar, a new guitar tone modeling plug-in capable of emulating an infinite number of guitar tones out of a single instrument. ​Re-Guitar can simulate many kinds of guitar tones (electric or acoustic), regardless of the guitar model used for recording. It includes a pickup simulator that emulates many models of renown electric guitar pickups and lets you create you own. The plug-in also includes a selection of acoustic guitar simulations, and you can craft your own too. It is also possible to emulate hollow body guitars and adjust the desired thickness of the body. In addition to brightness and gain adjustments, the plug-in provides virtual tone and volume pots to tweak the tone in details. In an industry-moving-and-shaking seismic shift, MIND Music Lab’s ELK MusicOS, the world’s first MOS (Music Operating System) for use in embedded environments, provides unmatched ultra low-latency performance using Intel X86 or ARM processors, which, when combined with ELK’s SDK (Software Development Kit), makes it easy for developers of VST (Virtual Studio Technology) and RE (Rack Extension) plug-ins to support ELK, ultimately ushering in a new era where the power, flexibility, and selection of audio and music software can be run in real time on embedded hardware. January 21, 2018, Berlin – Native Instruments today releases OPALINE DRIFT, a new Expansion that draws on downtempo indie-electronica and beyond. OPALINE DRIFT echoes the blissful reverie of indie-electronica, shoegaze, and contemporary electronic styles. With shimmering guitars, wistful synths, and warmly-textured drums, OPALINE DRIFT provides producers with a palette of iridescent colors and dreamy textures for building the foundations of sublime sonic excursions. January 22, 2019 - Accusonus Inc, developers of critically-acclaimed software and plug-ins such as drumatom, Regroover and Beatformer announce the release of the updated collection of multi-patented audio repair plugins, the ERA Bundle 3.0. The ERA Bundle offers both fast workflows and high-quality processing and it is the go-to toolkit for both entry-level and professional users who need agile audio repair. This version adds several updates, improvements and bug fixes for all available tools as well as a new breath-control module in the Voice Leveler plugin.. Most importantly, it includes the brand new, fully-automatic ERA De-Clipper. The ERA De-Clipper restores saturated audio segments and improves the overall signal quality. 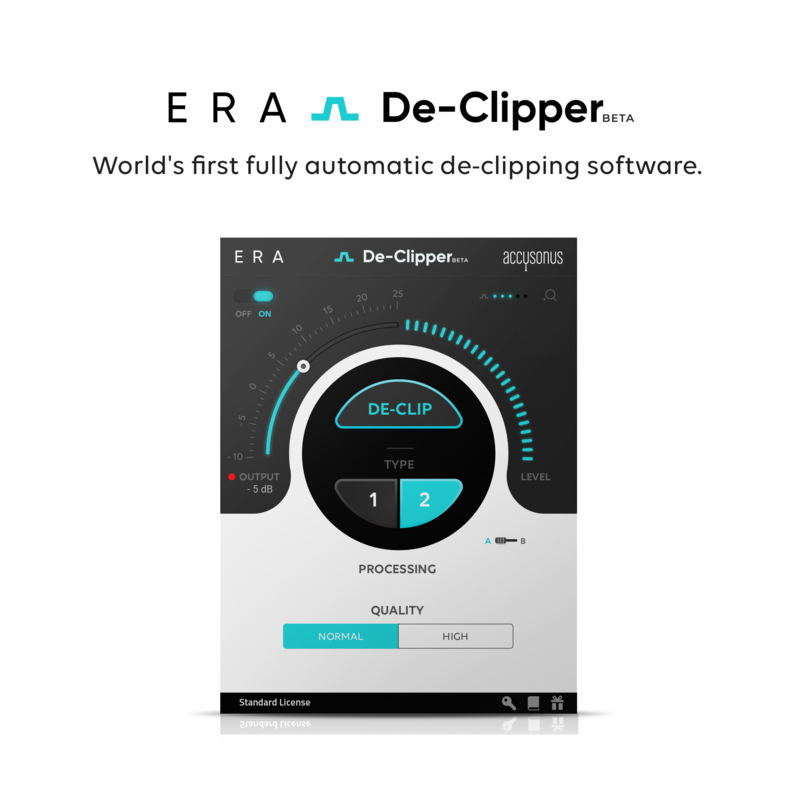 You don't have to mess with threshold adjustment anymore, as ERA De-Clipper automatically detects clipped parts and tunes the thresholds for you. ​The thinking behind Q Up Arts’ latest entry in its lengthening line of sample loop/packs — PC- and Mac-compatible with any platform that reads WAV files — is perfectly pitched in its to-the-point Pop Strings: UK titling. Two titans of creative contemporary UK pop strings stylings have joined forces thereon to focus on highly-intimate and romantic string arrangements. Think multi-platinum-selling singer-songwriters Adele and Sam Smith, written with compatibility and cross usage in mind. Musically, these gorgeous, lush arrangements are designed to inspire anyone who hears this aptly-named amazing collection, containing an array of detailed recordings arranged into packs where every element plays off the other. On top of those superlative solo and exquisite ensemble string parts, Pop Strings: UK ups the musical ante still further, featuring interesting and bespoke hip-hop beats, bass lines, piano, and keys to provide a plethora of soundscapes at anyone’s fingertips. As implied by its full — and appropriate — appellation, the Platform U22 VST USB 3.0 Super-Speed audio interface is deftly designed by iCON Pro Audio as a 24-Bit 96/192KHz 2-in/2-out device delivering super-speed connectivity for ultra-low latency, letting loose with superior sonic quality, a low noise floor, and ultra-fast processing as a compact, rugged, and versatile addition to the popular Platform MIDI/audio control concept, specifically tailored to match its series siblings.